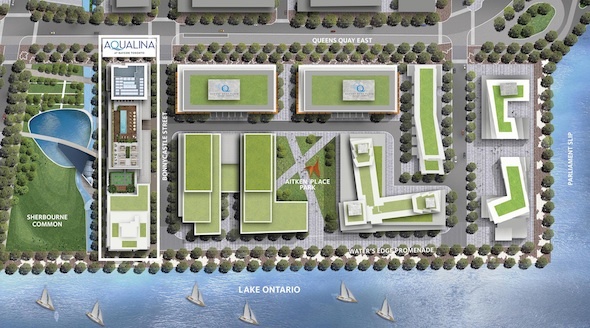 Aqualina Bayside is just a portion of a much greater development beginning to take shape on Toronto's waterfront, near Queens Quay and Lower Sherbourne. These condos, which will go on sale in the fall, mark the first residential phase of what will essentially be a pre-packaged neighbourhood. 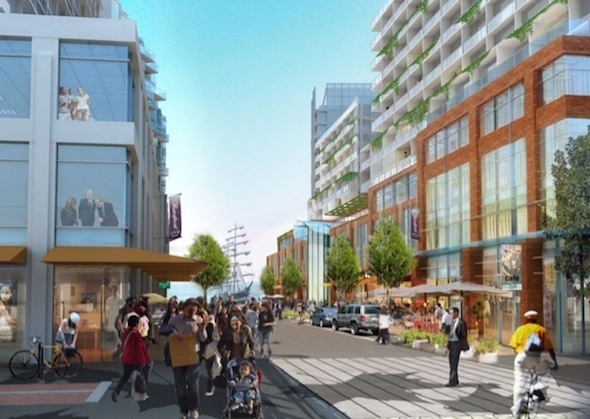 The $1.1 billion project will include about 1,900 condos and affordable rentals, as well as offices, retail and other commercial pursuits. Developers Tridel and Hine also say they're going to include greenspace and other open communal spaces wherever possible. While the expected completion date for these units is sometime in 2016, it'll likely take about a decade for the whole development to take shape. 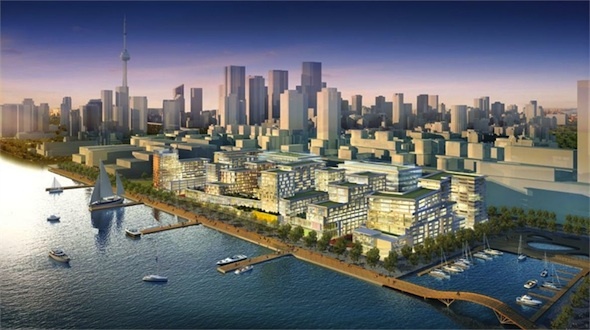 Aside from the size of the Bayside projectâthey say it'll span two million square feetâand its mixed-use nature, many of the details have yet to see the light. However, you can watch this weird imagination-land video, complete with inspiring music where it feels like you're flying around in an adobe after effects dreamworld, here. 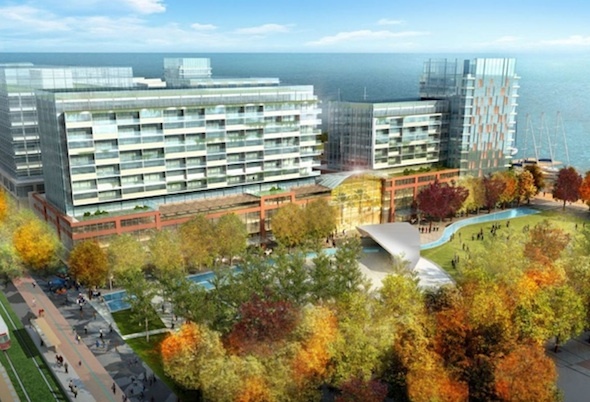 Address: 200 Queens Quay E.
Types of units: Range from one-bedroom to three-bedroom. Unit sizes (in square feet): 560 to 2,100. Amenities/building features: Rooftop with gardens, open spaces, "the fastest internet in the city"
As it stands, this stretch of the waterfront is still rather empty and under-used. It has sort of a barren wasteland feel to it, so it's technically a good thing that some life will be infused into the area. It'll be an especially good thing if the units actually turn out to be family-oriented and affordable, as the developers say. 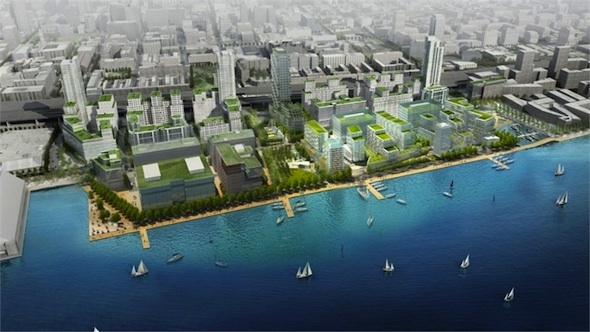 If they do this right, it could be a project after Jane Jacobs' own heart. Could be. Though it sounds a little too good to be true, the concept is off to a good start. George Brown's waterfront campus is right next door, and Corus Entertainment is next to that on the other side. The first floor of the George Brown campus is open to the public, trying to inspire a neighbourhood feel. The school is thinking of expanding its waterfront campus, too, which would bring more life to the area. 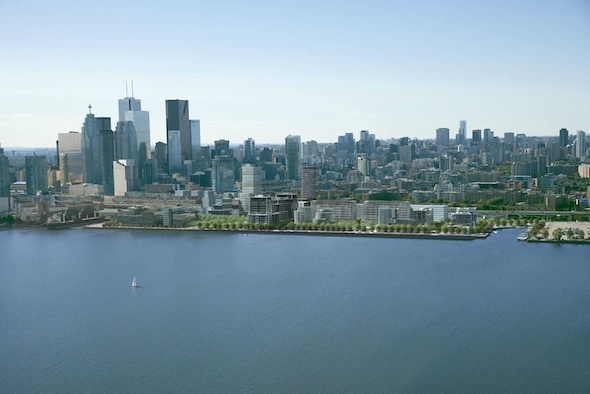 While renderings of specific units have yet to be released, they're sure to have stunning views, and it sounds like green space will be top of mind within the development. Because this whole stretch is being built all at once, and by the same developers, Bayside has the potential to come out the other side looking like a cookie cutter project. 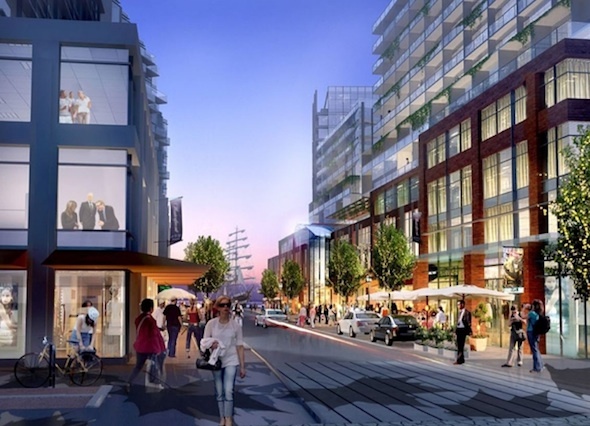 Forcing the existence of an entire neighbourhood will likely yield less-than-natural results, and the final outcome may take on some of the atmosphere Liberty Village is often criticized for: people coming home to their condos and hermitting, without much neighbourhood fun going on. Many of the buildings will have the same feel. Developers say the project will be "defined by a series of distinctive prismatic cubes made of glass and steel, featuring facades accented by angled fenestration." Hmm. I'm not too sure about the warmth/visual appeal of this. The other drawback here is transit. Those who live and work at Bayside will be relegated to taking the bus for the foreseeable future, as funding for the East Bayfront LRT is still a thing of smoke and mirrors. This project could either be very, very good, or very, very bad. On the one hand, you have a thriving, diverse area right along the water, with lower-income families, busnesses and higher-end condos all swimming along in harmony. On the other you have a cold, isolated series of "units." What do you think? Can this project work as well as developers say it will?